I (pastorhh) am having WAY too much fun with our Adult Forums this month! We are examining the stories behind famous Christmas carols, and what we are learning is so inspirational. 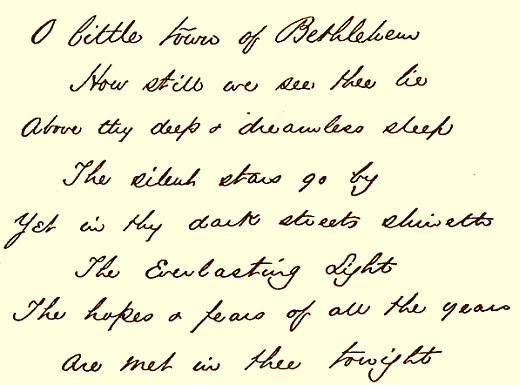 Join us this Sunday (12-8) to learn about Phillip Brooks’ amazing life and legacy, and in the meantime, enjoy a photograph of the first stanza of the hymn he penned in 1874, in his own handwriting.